posted on Apr. 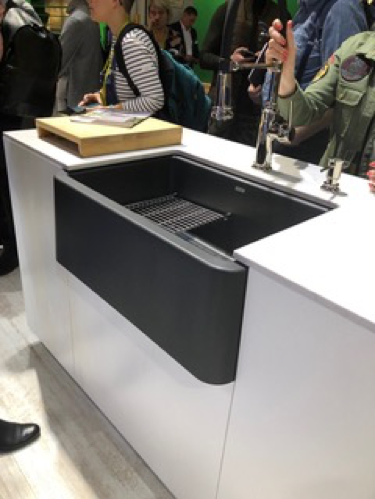 04, 2019, at 9:00 a.m.
My quest for what’s new in the world of kitchen designs is ongoing. I have been to KBIS for more years than I care to reveal — and it never gets old. I have been to Milan and recently returned from IMM Cologne/Living Kitchen with NKBA’s Global Connect program. I was excited to see first-hand an entirely new perspective on the kitchen. I am familiar with many German brands that show in New York but was eager to see even more, and some from other countries, too. Blanco’s IKON apron sink combines design, function and durability. I must admit I had some preconceived notions. Yes, I expected clean lines and a sleek silhouette but I often find some designs cold, and not organic. Unlike a few years ago, when it seemed that the American aesthetic was trying to follow the European, this show proved that both markets are evolving at the same time — sometimes with similar ideas, but executed differently. Here are some of my favorite discoveries. Take, for instance, the farmhouse sink. Many Americans love them (myself included) but I never expected to find them in Germany. In fact, the country look was everywhere you turned in Cologne. Among the many pieces to get the look, I fell in love with the “Faron XL” sink from Blanco. It was both charming and contemporary and would be right at home in my 1860s house in Connecticut. I was taken with the beautiful “+Venovo” kitchen at Poggenpohl. The designers wanted “to give the room less kitchen but the kitchen more room.” With clean, linear designs, the kitchen unit seems like living-room furniture. This freestanding piece actually incorporates a worktop, oven, refrigerator and sink all in one beautiful unit. And I mean beautiful. As open-concept kitchens evolve, this piece seamlessly works as a kitchen in your living room. Amazing. Finally, in perhaps the most European aspect of the show, I experienced the exhibition FutureKitchen. In a treatise entitled “Sense & Sensuality,” Alfredo Haberli offers a kitchen for the near future. “The design deals with de-growth both plastically and architecturally,” he says. He created a four-level kitchen: the first with loosely laid bricks, creating noise as you walked on them, meant to slow you down in a sensual way. The second layer is a bright green, intended to separate itself from the rest of the exhibition. The third layer is everyday life with familiar objects that are twisted in a way that confuses the viewer. Finally, an augmented reality app helps you discover newly invented kitchen utensils. It was all meant to be a stimulus, and thanks to its radical abstraction, to encourage reflection. It did all that — and then some — for me. In fact, the entire visit to Cologne did just that.